Originally published in the anthology Dressed to Kiss. Evan Hewes, Earl of Carmarthen has big plans to tear down all the old buildings on Vine Street and rebuild everything all modern and new. Felicity Dawkins has lived and worked in her mother's modiste shop Madame Follette's on Vine street since she was born. Felicity's mother was the last of the shop owners left on the block who refused to sell to Evan. Unaware of the changes coming to Vine Street and Evan's offer to buy from her mother, Felicity sends her mother on a trip. During her mother's absence, Felicity hopes to modernize the shop and the dresses they sell. This is the point where Evan and Felicity first meet and he comes to convince her to sell the shop to him. I loved the immediate attraction between Evan & Felicity. It was fun to watch their romance blossom and for them to realize that although they came from different worlds, they had many things in common. My favorite line from the book; "He let out a breath of relief even as he recognized the danger he was in. God help him. She was in trade. His mother wanted to employ her. But in trade or not, she was the most beautiful woman he’d ever seen. She made him laugh, she challenged him—and won—and she made him think, as the gas lamps were lowered and the performance began, that if he did nothing and she disappeared from his world, he might spend the rest of his life searching for another glimpse of her." Such a great story from author Caroline Linden! Highly recommend! 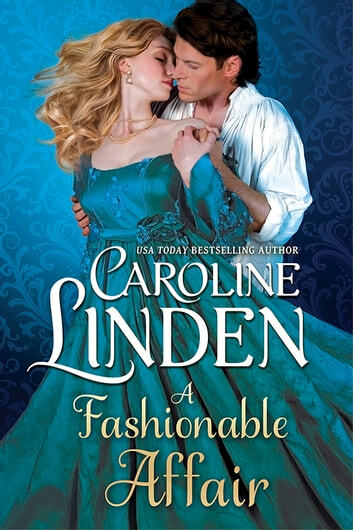 Those of you who have read Caroline Linden’s books know what an exceptionally gifted writer she is, you who have not will need to read this novella to truly appreciate the Ms. Linden’s rare talent. Evan Hewes, the Earl of Carmathen, is bent on modernising and beautifying the area where Madame Follette’s shop stands. Madame Follette’s is located near Bond Street, business is doing alright, but could be better. Feliticy Dawkins is managing the modiste shop for her mother, while the latter is away. Madame Follette’s has been in the family for several years, but when Carmathen tells Felicity Dawkins that she must vacate the premises, she bluntly refuses. And so begins one of the most wonderful love stories ever written. When Carmathen goes to Madame Follette’s, he expects the mother, not breathtakingly beautiful Felicity, but still he won’t budge either. Until Felicity starts to get under his skin, and he decides to help her, whichever way he can. While they agree to disagree, Felicity warms up to the Earl, until she realises that she wants to be his, whatever the consequences; he will not marry a mere shop girl, surely. And oh how exquisitely Ms. Linden conveys those feelings of falling in love, of being in love! I don’t believe I’ve ever read anything, anywhere that describes what love is more accurately, more emotionally. Ms. Linden’s lush and sumptuous prose is so evocative that the words become images; the dialogues are brilliantly simple and historically accurate. Felicity and Carmathen discuss things rationally instead of bickering, they reach compromises. And when the delicious flirtation becomes more, well, one almost wishes that smelling salts hadn’t gone out of fashion, because that’s how it made me feel. What a glorious romance. Felicity and Carmathen’s passion becomes all-encompassing, so beautiful, so touching, and it all feels so real. A FASHIONABLE AFFAIR is a triumph of exquisite, sublime writing, blistering sensuality, and a love so true, it takes a few moments to come back to reality. A FASHIONABLE AFFAIR is a magnificent novella, the epitome of fine writing, and the joy of experiencing love. I believe I have run out of superlatives, but this story deserves them all! I voluntarily reviewed an advanced reader copy of this book.